The A-Myb transcription factor is structurally related to the c-myb proto-oncogene and is involved in the control of proliferation and/or differentiation of mature B lymphocytes. We have shown previously by PCR analysis that A-myb is preferentially expressed in CD38+CD39−sIgM− mature B cells. We demonstrate here, using in situ hybridization, that A-mybexpression is restricted to the dark zone of human tonsils and lymph nodes. Furthermore, we show that A-Myb expression is cell cycle regulated both in tonsillar B cells and in Burkitt’s lymphoma cell lines, being detectable only in the S and G2/M phases of the cell cycle and not in G0/G1 phase. Strong proliferation of resting human B cells induced in vitro by a variety of physiologic signals, including anti-μ, CD40 ligand, IL-2, IL-4, IL-6, IL-13, IFN-γ, TNF-α, anti-CD19, and anti-CD20, failed to induce A-myb expression, suggesting that proliferation alone is not sufficient for A-myb expression in the absence of induction of a true centroblast phenotype. Finally, we show that differentiation of germinal center B cells in vitro toward either memory or plasma cells is accompanied by rapid down-regulation of A-myb expression. We conclude that A-myb is a marker of centroblasts generated in vivo. A-Myb belongs to the myb family of transcription factors, which include in mammals the v-myb oncogene, its normal cellular equivalent c-myb, and the two structurally related B-myb and A-myb genes (1, 2, 3, 4). All members of the Myb family have been shown to be involved in the control of proliferation and/or differentiation of different hemopoietic cells (3, 4). In particular, v-Myb and c-Myb block the differentiation of myeloid, erythroid, and immature multipotent progenitors (5, 6, 7, 8). C-Myb is required for the proliferation of hemopoietic cell lines of different lineages (9), and c-myb knockout animals die in utero due to a complete block of fetal hemopoiesis (10). B-Myb has been shown to be required for the proliferation of many cell types including fibroblasts and smooth muscle cells, and its expression, in general, correlates strictly with proliferation (11, 12, 13, 14). The third member of the family, A-Myb, shows the most restricted pattern of expression: in the adult mouse, it is expressed in some proliferating neuronal precursor cells, in spermatocytes, breast ductal epithelium, and germinal center (GC)3 B lymphocytes (15, 16, 17, 18). In human hemopoietic cells, A-Myb has been detected only in a subpopulation of mature tonsillar B lymphocytes, with the phenotype CD38+, CD39−, and mostly sIgM− and is therefore presumably localized within GC (19, 20). Furthermore, the study of a panel of B cell lines and fresh B leukemia samples representing B cell differentiation from pre-B cells to plasma cells showed that A-Myb is expressed only in Burkitt’s lymphoma cells, presumably representing the neoplastic counterpart of GC cells, and in a fraction of B-CLL (21). These findings have led to the hypothesis that A-Myb plays a role in the control of proliferation and/or differentiation of mature B cells (22). Very recently, this hypothesis has gained much strength from transgenic experiments. Mice expressing ectopic A-Myb in a wide range of tissues showed specific deregulation of the B cell compartment, with hyperplasia of the spleen and lymph nodes and accumulation of a mature polyclonal B cell population with a CD38+ phenotype (23). Germinal centers are central to the differentiation and function of B lymphocytes (24, 25, 26). Naive mature B lymphocytes migrate from the bone marrow to peripheral lymphoid organs. Upon Ag encounter in the T cell areas of spleen and lymph nodes, B cells migrate to the follicles where the activated cells will form GC. GC B cells undergo extremely rapid proliferation (estimated doubling time, 6–7 h) and somatic mutation of their Ig gene within the dark zone of GC, which contains mostly large proliferating B cells or centroblasts. Further differentiation of centroblasts to centrocytes is accompanied by migration to the light zone of GC and arrest of the proliferation. The light zone contains the follicular dendritic cells (FDC) and GC helper T cells, which are thought to be important in regulating the B cell differentiation processes taking place in this region of GC: apoptosis of B cells with low affinity for the Ag, leading to affinity maturation, and differentiation to memory cells or to preplasma cells, which will then migrate to the bone marrow for full differentiation to plasma cells. The latter processes also involve isotype switching for the production of different Ig classes. Thus, the very fine compartmentalization of the GC has allowed a precise understanding of the sequence of events that takes place in GC, through the study of cell markers and morphology, expression of specific genes, and the mutation and recombination of Ig genes in normal and genetically modified animals (24, 25, 26). In turn, knowledge of the localization of new gene products within GC can indicate the potential function of such products. Previous experiments using purified tonsillar B cell subpopulations had suggested that the A-Myb transcription factor is expressed by GC B cells, but its possible subcompartmentalization within this structure had not been investigated (20). Given the important role demonstrated for this transcription factor in B cell differentiation, our goal was to determine the pattern of A-Myb expression in GC in vivo and in models of B cell proliferation and differentiation in vitro. We show that A-Myb is specifically expressed in proliferating centroblasts generated in vivo and is not induced in B cells activated in vitro. Furthermore, it is down-regulated during differentiation of centroblasts to more mature cells. Thus, among known B cell-restricted transcription factors, A-Myb shows the most restricted pattern of expression. Tonsils were obtained from routine tonsillectomies. Axillary and mesenteric lymph nodes were obtained from specimens of patients with unrelated pathologies. All tissues used for in situ hybridization were formalin fixed and embedded in paraffin. Total tonsillar B lymphocytes were purified as described previously (20). Briefly, tonsils were minced to a single-cell suspension and centrifuged over a Ficoll-Hypaque gradient (Seromed, Berlin, Germany). T cells were removed by rosetting with aminoethylisothiouronium-treated SRBC and centrifuging through a Ficoll-Hypaque gradient. Total B cells at the interface were further separated into different fractions on a discontinuous gradient made of 80, 57, 50, 40, and 30% Percoll (Pharmacia, Uppsala, Sweden). The 80 to 57% Percoll interface consisted mostly of resting small B lymphocytes. The 40 to 50% interface was highly enriched (at least 80%) with GC B cells strongly positive for both CD38+ and CD20+. B cell purity of both the GC and resting B cell fractions was 96 to 98%, as judged by staining with an anti-CD40 or anti-CD19 Ab. Daudi and Ramos cell lines were from the American Type Culture Collection (Rockville, MD). All cells were grown in RPMI 1640 (Seromed), supplemented with 10% FCS (HyClone Laboratories, Logan, UT), glutamine (Life Technologies, Paisley, Scotland), and 50 μg/ml gentamicin (Life Technologies). Cells were resuspended at 3 × 105/ml 24 h before sorting. For A-myb-specific in situ hybridization, a fragment of A-myb spanning nucleotide (nt) 1190–1550 (2) was cloned in the pGem3 vector (Promega Corp., Madison, WI). Briefly the XbaI-HindIII 360-bp fragment from plasmid A-myb-PCR was subcloned in the same sites of pGem3. For B-myb in situ hybridization, a 390-bp SacI-PstI fragment (nt 742–1133) was subcloned in the same sites of the pGem4 plasmid. The probes for in situ hybridization were labeled with[35S]UTP (Amersham, Little Chalfont, Buckinghamshire, U.K.) using the Riboprobe kit (Promega). The A-myb, B-myb, and cyclin A probes used for Northern blot hybridization have been described elsewhere (19, 27) and were labeled with[32P]dCTP (Amersham) with the Megaprime DNA labeling system (Amersham). In situ hybridization was performed essentially as described by Wilkinson (28) with minor modifications. Briefly, myb sense and antisense probes were generated by transcription with the T7 and SP6 polymerases (Riboprobe kit, Promega) in the presence of[35S]CTP (Amersham). The template was then degraded in RNase-free DNase (Pharmacia), and the labeled probe was purified through a Sephadex G-50 (Pharmacia) column followed by NH4 acetate precipitation. The probes were dissolved at a working concentration of 106 cpm/μl in hybridization mix. Before hybridization, the sections were treated with 3 μg/ml proteinase K, fixed in 4% paraformaldehyde in PBS, and finally washed in a solution of 0.25% acetic anhydride in 0.2 M triethanolamine. Then, 30 μl of the appropriate probe was added to each slide, and the hybridization was conducted overnight at 55°C. The slides were then washed under stringent conditions (65°C, 2× SSC, 50% formamide) and treated with 100 μg/ml RNase A (Sigma) to remove unhybridized and nonspecifically bound probe. Autoradiography was performed with Kodak NT/B2 emulsion. Exposure times were between 2 and 3 wk. After developing, the sections were mounted in DPX (Merck, Darmstadt, Germany). Adjacent sections were processed for histologic staining or immunohistochemistry. Recombinant trimeric human CD40 ligand (CD40L) was obtained from Immunex (Seattle, WA) and used at 1 μg/ml. rIL-2 (Eurocetus, Amsterdam, Holland) was used at 200 U/ml, rIL-4 (Immunex, Seattle, WA) at 50 ng/ml, rIL-6 (Serono, Roma, Italy) at 5 ng/ml, rIL-10 (Shering-Plough, Milano, Italy) at 20 ng/ml, and rIL-13 (Sanofi, Montpellier, France) at 40 ng/ml; IFN-γ was from Roussel-UCLAF (Paris, France) at 200 U/ml and TNF-α (BASF Pharma Knoll, Ludwigshafen, Germany) at 10 ng/ml. F(ab′)2 Goat anti-human μ-chain (Cappel, Organon Teknika Corp., West Chester, PA) was used at 25 μg/ml. The purified anti-CD19 Ab, HD37, was a kind gift of Dr. G. Moldenhauer (Deutsches Krebsforschungszentrum, Heidelberg, Germany) and was used at 1 μg/ml for stimulation. The Ab against CD20, 1F5, was a kind gift of Dr. E. A. Clark (University of Washington, Seattle, WA) and used at 2 μg/ml. Resting or GC B cells were cultured at 1 to 2 × 106/ml with the indicated stimuli. Double immunofluorescence staining was performed with CD20-FITC and CD38-phycoerythrin Abs (Becton Dickinson, San José, CA). 7 × 105 cells/ml were stained with 20 μg/ml Hoechst 33342 and sorted with a FACSVantage instrument (Becton Dickinson) equipped with a 5 W argon-ion laser emitting 20 mW of UV light (352 nm). Cells were lysed in SDS sample buffer containing protease and phosphatase inhibitors. In some experiments, cells were fixed in 80% EtOH and stained with propidium iodide before sorting. Both methods gave the same results. A fraction of sorted cells were reanalyzed and found to be at least 95% pure with respect to cell cycle phase. RNA was extracted by standard guanidium isothiocyanate and cesium chloride gradient purification. Total RNA (18–20 μg) was run in 1% formaldehyde-agarose gels and blotted onto GeneScreen Plus membrane (New England Nuclear, Boston, MA), and hybridization was performed according to the manufacturer’s instructions. The A-Myb-specific antiserum has been described previously (29) and was used a a 1/1000 dilution. The anti-cdk2, anti-p27, and anti-actin antisera were from Santa Cruz Biotechnology (Santa Cruz, CA). To control for A-Myb antiserum specificity, the A-Myb-negative myeloma cell line IM-9 was transfected with the complete A-mybcDNA cloned in the episomial pCEP4 vector (Invitrogen Leeks, The Netherlands) or with the empty vector, using electroporation (270 mV, 960 μF in a Bio-Rad Gene Pulser; Bio-Rad, Hercules, CA). Transfected cells were selected by culture in 500 μg/ml hygromycin B (Boehringer Mannheim, Mannheim, Germany). Pools of transfected hygromycin resistant cells were obtained after 3 to 4 wk of culture. Then, 1 to 2 × 106 transfected or untransfected B cells were lysed in SDS loading buffer and run in a 10% SDS-polyacrylamide gel. The gels were electroblotted onto nitrocellulose filters (Schleicher and Schuell, Dassel, Germany) for 5 h at 60 V, according to standard procedures. The blots were incubated with the Abs diluted in PBS containing 5% nonfat milk powder and washed in the same solution containing 0.5% Nonidet P-40. Detection was performed using the enhanced chemiluminescence system (ECL; Amersham). Previous data both in the mouse and in human B cells had indicated that A-Myb is expressed by GC B cells, but the localization of A-myb gene expression in the different GC compartments had not been investigated (15, 20). We decided, therefore, to use in situ hybridization to answer this question. A 360-bp fragment of human A-myb cDNA spanning a region not conserved with other myb genes was subcloned in the pGem3 vector for generation of antisense and control sense RNA probes using the SP6 and T7 polymerases, respectively. As a control, a similarly unique 390-bp fragment of human B-myb cDNA was subcloned in the pGem4 vector. B-myb expression correlates with proliferation in many cell types, including tonsillar B cells, and was therefore expected to stain the proliferating B cells in the dark zone of GC (3, 4). 35S-labeled sense and antisense RNA probes were generated with SP6 and T7 RNA polymerases and used to hybridize serial sections of formalin-fixed human lymphoid tissues, including tonsils, lymph nodes, and spleen. Adjacent sections were also stained with hematoxylin or with the Ki67 Ab to identify the dark zone of GC (30, 31). Representative results obtained with a lymph node and a tonsil are shown in Figures 1⇓ and 2, respectively. In the lymph node section of Figure 1⇓, the compartmentalization of the GC is most evident, with clear staining of dark zone B cells with the Ki67 Ag (Fig. 1⇓A). As expected, B-myb positivity correlated with expression of the Ki67 Ag and therefore with proliferating cells in the dark zone of GC (Fig. 1⇓B). The follicular mantle, T cell area, and light zone of GC were mostly negative for B-myb expression. The pattern of A-mybexpression was very similar to that of B-myb and correlated closely with Ki67 expression. Small differences in A-myb, B-myb, and Ki67 positivity probably reflect the fact that different probes were used on adjacent sections. Sections from the same tissues were also hybridized with the sense probes as negative controls and did not show any specific signal (data not shown). As shown in Figure 2⇓, the pattern of expression was similar in tonsil sections, with a clear correspondence between A-myb (Fig. 2⇓C), B-myb (2D), and Ki67 (2B) expression within the GC. Of note, however, was the fact that the layer of proliferating epithelial cells (E) clearly marked by Ki67 also strongly hybridized with the B-mybprobe (marked with a double arrow in Fig. 2⇓D) but not with the A-myb (Fig. 2⇓C). This demonstrates the specificity of A-myb expression for the proliferating centroblasts of the dark zone, whereas B-mybis expressed in all proliferating cell populations present, including centroblasts. Also, in spleen sections A-myb was specifically expressed in the dark zone of GC (data not shown). In situ hybidization of the lymph node. Serial sections of human lymph nodes were hybridized with A-myb (C) and B-myb (B) 35S-labeled probes. Adjacent sections were stained with the Ki67 Ab (A) (31). FM, follicular mantle; LZ, light zone; DZ, dark zone. In situ hybridization of the tonsil. Serial tonsil sections were hybridized with A-myb (C) orB-myb (D) probes or stained with hematoxylin-eosin (A) or with the Ki67 Ab (B). GC, germinal center; T, T cell area; E, epithelial layer. The association of A-myb expression with the dark zone of GC and therefore with proliferating centroblasts suggested that A-Myb may play a role in proliferation and may be regulated in the cell cycle in these cells (24, 25). To verify this hypothesis, we stained purified tonsillar B cells with DNA dyes and sorted the B cell populations according to the cell cycle phase. Equivalent numbers of sorted cells were then analyzed for A-myb expression in Western blots, as verified by Ponceau red staining of the blot. It was demonstrated that the anti-A-Myb antiserum was specific for A-Myb by Western analysis of the IM-9 cell line transfected with either the complete A-myb cDNA in an expression vector or with the empty vector. The antiserum specifically recognized a 90-kDa band in A-myb-transfected and not in vector-transfected cells (Fig. 3⇓A). In sorted tonsillar B cell populations, the 90-kDa A-Myb protein could be detected only in the S and G2/M phases of the cell cycle but not in G0/G1. To verify that sorting according to cell cycle phase had been successful, the same blot was stained with an anti-p27 Ab. As expected, p27 is strongly expressed in the G0/G1 cell population and is efficiently down-regulated in S/G2/M phase cells (Fig. 3⇓A) (32). Furthermore, the blot was stripped and reprobed with anti-Actin Ab, showing that each of the lanes contained equivalent amounts of protein (Fig. 3⇓A). Cell cycle analysis of A-Myb expression. A, To verify the specificity of the A-Myb antiserum, lysates from the IM-9 myeloma cells transfected with an A-Myb-expressing or empty vector were analyzed in Western blots. Tonsillar B cells or the exponentially growing Daudi and Ramos BL lines were stained with Hoechst 33342 and sorted for cell cycle phase. Equivalent numbers of cells (1–1.5 × 105) were loaded in each lane of a 10% SDS-polyacrylamide gel. Blotted proteins were analyzed for A-Myb (90 kDa), Cdk2 (34 kDa), p27 (27 kDa), and Actin (43 kDa) expression by Western blotting. The results are representative of at least two independent experiments for each cell line. B, Both the Hoechst-stained unfractionated cells (starting population) and the fractions sorted according to cell cycle phase (sorted fractions) were analyzed on the FACS. One representative result obtained with the Ramos cell line is shown. The % purity of each fraction is indicated. A-Myb is also highly expressed in most Burkitt’s lymphoma cell lines, which are probably the transformed equivalent of normal centroblasts (20, 21, 33). We therefore verified whether A-Myb was cell cycle regulated also in A-Myb-positive BL lines. The exponentially growing lines Ramos and Daudi were sorted on the FACS according to cell cycle phase. 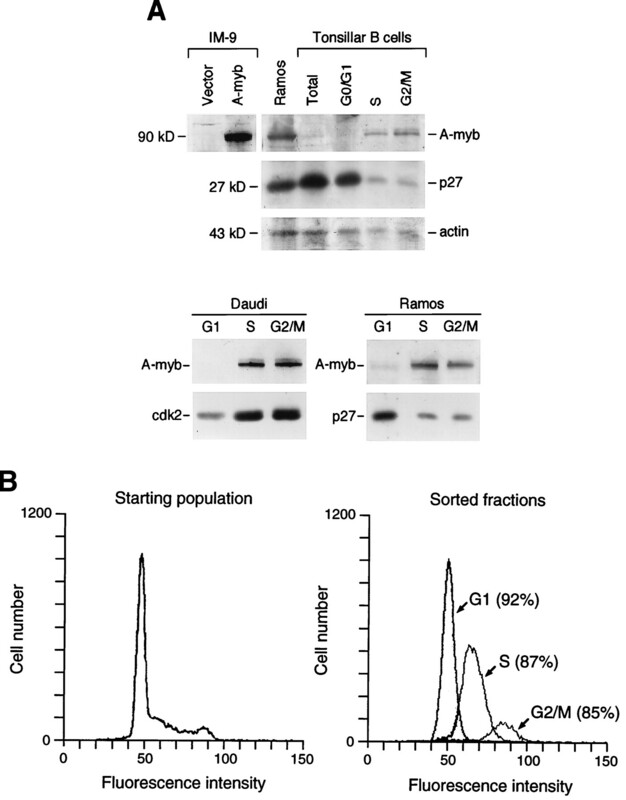 Again, A-Myb protein was found to be strongly expressed in the S and G2/M phases of the cell cycle but not in G1. That all lanes contained protein and that cell separation was adequate was verified by Ponceau red staining of the blot (data not shown) and by testing the same blots for either Cdk2 (which is more strongly expressed in S phase than in G1 phase) or p27 expression (Fig. 3⇑A). Furthermore, the purity of the different cell cycle phases was regularly determined on the FACS and found to be >82% for all phases. One representative example of such cell cycle analysis on the Ramos cell line, before and after sorting, is shown in Figure 3⇑B. We conclude that A-Myb expression is restricted to the S and G2/M phases of the cell cycle in both normal and BL cell lines. Resting tonsillar B cells can be induced to proliferate in vitro by a number of agents, including crude polyclonal B cell activators such as SAC (formalin-killed Staphylococcus aureus Cowan I strain bacteria), drugs such as PMA and Ca2+ ionophores, Abs against cell surface molecules, and presumably more physiologic signals such as different combinations of anti-μ, trimeric CD40L, and a variety of cytokines (34, 35). We had previously observed that the induction of B cell proliferation in vitro by nonphysiologic signals (SAC, PMA + calcium ionophore, etc.) was not accompanied by the induction of A-Myb (20). This was somewhat puzzling in view of the finding described above that A-Myb is expressed by the highly proliferating centroblasts and is cell cycle regulated in these cells. We therefore set out to investigate whether more physiologic means of inducing proliferation of resting B lymphocytes in vitro could induce A-myb expression. As shown in Figure 4⇓ and Table I⇓, we used a wide combination of signals including anti-μ or anti-CD20 Abs with trimeric CD40L and/or different cytokines, i.e., IL-2, IL-4, IL-6, IL-10, IL-13, TNF-α, and IFN-γ, or an anti-CD19 Ab. The cytokines were chosen among those known to induce either growth or differentiation of B cells or both. TNF-α was chosen because it is known to be required for GC formation in vivo. IFN-α as well as anti-CD19 were chosen because they have been reported to induce a partial GC phenotype to resting B cells in vitro (36). Proliferation was measured by thymidine incorporation and in some cases cell cycle analysis. All combinations used stimulated strong proliferation of resting B cells, the combination of anti-CD20 and IFN-γ being the only relatively weak stimulus (Table I⇓). RNA was extracted from resting B cells at the beginning of culture and 3 days after stimulation of proliferation and analyzed for A-myb expression in Northern blots. 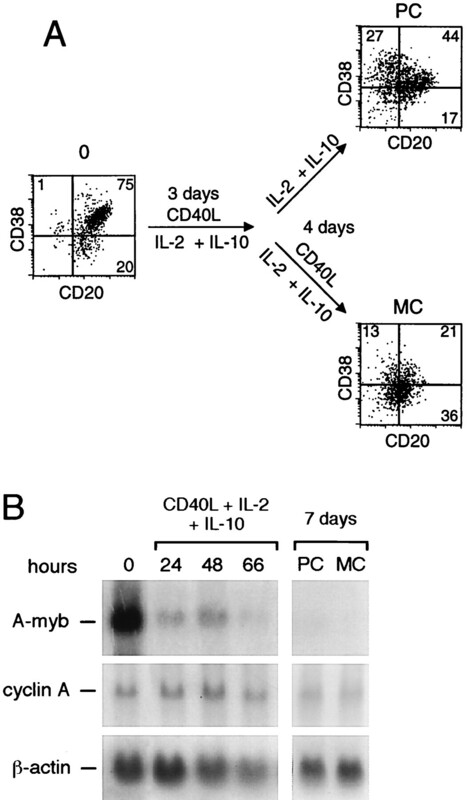 As shown in Figure 4⇓, whereas GC B cells express high levels of A-myb RNA, resting B cells induced to proliferate did not express detectable levels of A-myb. To verify that other cell cycle-regulated genes characteristic of the S/G2/M phases of the cell cycle could be induced in the same conditions, the blots were rehybridized with a cyclin A cDNA probe and, in some cases, also with B-myb. As shown in Figure 4⇓, both B-myb and cyclin A were efficiently induced by all of the stimuli employed to levels corresponding roughly to the levels of thymidine uptake or S/G2/M phase induction. Indeed the percentage of cells in the S/G2/M phases of the the cell cycle obtained with the most effective stimuli, such as anti-μ + CD40L + IL-2 + IL-10, corresponded approximately to that of purified GC B cells (Table I⇓). However, the levels of A-myb expression were clearly very different in the two populations (Fig. 4⇓, lane 1 compared wiht lanes 3–15). Most stimulation regimens were also tested for A-Myb protein expression in Western blots. Again, A-Myb could be detected in purified tonsillar GC B cells but not following stimulation of resting B cells (data not shown). 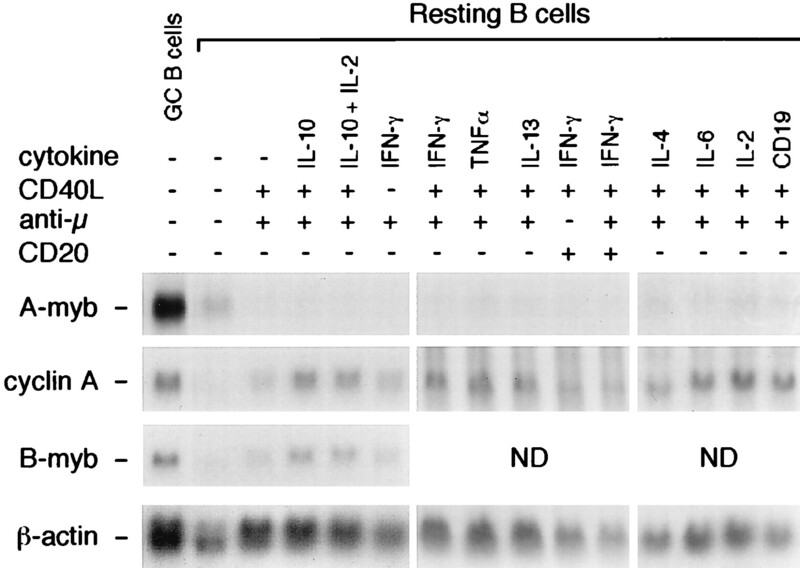 A-myb expression in GC B cells and resting B cells induced to proliferate in vitro. Dense resting B cells were induced to proliferate with the indicated stimuli. RNA was extracted from the GC-enriched fraction (lane 1) or from the resting B cells at the beginning of culture (lane 2) or after 66 h (lanes 3–15) and analyzed by Northern blotting. The same blots were hybridized with A-myb, B-myb, cyclin A, andβ-actin. We conclude that A-Myb is expressed in centroblasts generated in vivo but not in tonsillar resting B cells induced to proliferate in vitro. The latter, however, do not have a full centroblast phenotype, in agreement with several previous studies (36). Although IFN-γ did lead to doubling of CD38 levels as reported (36), other markers of centroblasts were not obtained during our culture conditions (in particular, all activated B cell populations showed high CD39 expression, unlike GC B cells, which are CD39−; data not shown). CD38+CD20+ GC B cells can be induced to proliferate and differentiate in vitro toward either memory or plasma cells, a process that can be followed by a down-regulation in CD38 or CD20, respectively (37, 38, 39). Given the restricted expression of A-myb in centroblasts in vivo, we investigated whether differentiation of these cells in vitro along both of the differentiation pathways was accompanied by down-regulation of A-myb expression. Purified GC B cells were cultured in the presence of CD40L, IL-2, and IL-10for 3 days, washed, and replated in medium containing IL-2 and IL-10 in either the presence or absence of CD40L for an additional 4 days. As reported by others (37), these culture conditions led to partial differentiation of the GC B cells toward memory (CD20+CD38−) (MC) or plasma-like cells (CD38+CD20−) (PC), respectively (Fig. 5⇓A). Plasma-like cells increased from 1 to 27% after 7 days of culture and memory cells from 20 to 36% (Fig. 5⇓A). In addition, an early and transient peak of proliferation was observed at 24 h, as determined by thymidine uptake and cell count (data not shown). We then investigated the time course of A-myb expression during the same culture period. As shown in Figure 5⇓B, A-mybexpression was rapidly down-regulated, having decreased at least threefold after 24 h and disappearing completely by 66 h. Differentiation toward either memory or plasma cells did not lead to later induction of A-myb. Expression of cyclin A, on the other hand, reflected the proliferative activity of the cells during the in vitro culture (Fig. 5⇓B). We conclude that A-myb expression in centroblasts is rapidly down-regulated both in vitro and in vivo during differentiation to centrocytes and then to memory or plasma cells. Differentiation of GC B cells in vitro. The GC-enriched fraction of tonsillar B cells was cultured with the indicated stimuli for a total of 7 days. At the indicated times, a fraction of cells was either double stained for CD20 and CD38 (A) or used for RNA extraction and Northern blot analysis for A-myb,cyclin A, and β-actin expression (B). In this report, we demonstrate by in situ hybridization of human tonsils and lymph nodes that the A-Myb transcription factor is expressed during a narrow window of B cell differentiation taking place in the dark zone of GC. Furthermore, in both normal centroblasts and Burkitt’s lymphoma cell lines, which may represent the transformed equivalent of centroblasts, A-Myb is expressed only during the S and G2/M phases of the cell cycle and not in G0/G1. Perhaps surprisingly, however, A-Myb is not up-regulated during in vitro stimulation of purified resting tonsillar B cells induced to proliferate with a variety of physiologic stimuli such as anti-μ, CD40L, IL-2, IL-10, IL-4, IL-6, IL-13, TNF-α, IFN-γ, anti-CD20, and anti-CD19 Abs in different combinations. Thus, the simple induction of proliferation in vitro is not sufficient for A-Myb expression but may require the acquisition of a true centroblast phenotype. In vitro differentiation of GC B cells with CD40L, IL-2, and IL-10, however, led to the rapid disappearance of A-myb mRNA levels, in accordance with in situ hybridization data showing that centrocytes are negative for A-mybexpression. We conclude that A-Myb is a transcription factor that is specifically induced in centroblasts during the in vivo GC reaction. We had previously investigated A-myb expression in different subpopulations of human tonsillar B cells using sorting by FACS and PCR analysis (20). These data had already suggested that A-Myb is expressed in GC B cells. Furthermore, studies of A-myb expression in mice by in situ hybridization had confirmed a GC localization for this gene (15). In neither case, however, had it been possible to analyze the localization of A-myb within the different GC subcompartments. In this report, we have demonstrated that A-mybis specifically expressed in the dark zone of GC and therefore in centroblasts, which show an extremely high rate of proliferation (with a cell cycle of about 7 h) and undergo somatic mutations of their Ig (24, 25, 40). Further differentiation of centroblasts to centrocytes, which move to the light zone of GC, leads to the elimination of cells with low affinity for the Ag through apoptosis, resulting in affinity maturation (24, 25, 41). Also, the processes of isotype switching and further differentiation to memory and plasma cells is thought to take place in the light zone of GC, which in addition to centrocytes contains FDC and some T cells (24, 41). Thus expression of A-Myb in centroblasts suggests that this transcription factor may be associated with the process of somatic mutation or with the particularly high rate of proliferation of these cells. A role for A-Myb in centroblast proliferation is also supported by its regulation during the cell cycle. Also, in bovine smooth muscle cells, A-myb has been shown to be induced during the G1/S phase transition (42). Furthermore, these data are reminiscent of the specific A-myb expression only in proliferating populations of cells in the mouse (immature spermatocytes and neuronal and breast ductal epithelium) (15, 18). However, simple proliferation of mature human B cells, induced either by polyclonal B cell activators (20) or by more physiologic signal as reported here, is not sufficient to induce A-myb expression, even though the percentage of S/G2/M phase cells obtained after 3 days of culture with many combinations of stimuli was similar to that of purified GC B cells that expressed high levels of A-myb. It is known, however, and has been verified in our culture conditions, that in vitro stimulation of resting B cells does not to lead to the formation of true centroblast-like cells (36). Anti-μ together with IFNs induce CD38 and CD95 but not carboxypeptidase-M, a marker of in vivo centroblasts; nor do they down-regulate CD44, which is normally absent from centroblasts (36). We found that whereas anti-μ + IFN-γ was indeed the most effective stimulus to induce CD38 on resting B cells, none of the culture conditions used led to a down-regulation of CD39 (data not shown). We suggest, therefore, that A-Myb is a marker of proliferating centroblasts produced in vivo and that culture conditions that do not induce a true centroblast phenotype cannot up-regulate A-Myb expression. Similarly, in vitro differentiation of GC B cells led to a rapid disappearance of A-myb expression, in accordance with the in situ data showing that centrocytes do not express this gene. Thus, A-Myb is the B cell-restricted transcription factor with the narrowest pattern of expression during B cell differentiation. As shown in Figure 6⇓, Bcl-6 (43) is most similar to A-Myb, but is expressed in both centroblasts and centrocytes. Blimp-1 (44) is present only during the latest stages of B cell differentiation, whereas BSAP (pax-5) (45) and the coactivator OCA-B (OBF-1/Bob-1) (46) show a more widespread expression pattern in B cells. Pattern of expression of B cell-specific transcription factors during differentiation. The stages of B cell differentiation during which the indicated transcription factors are expressed are represented schematically. It is worth noting that A-Myb is cell cycle regulated in both Burkitt’s lymphoma lines and normal B cells. Thus, the transformation event in Burkitt’s lymphoma has not apparently altered this regulation of A-myb expression, despite the localization of the A-myb genome relatively close to the translocated c-myc gene (3). It is interesting to note that all members of the Myb family in mammals have been shown to play a direct role in the control of either proliferation or differentiation or both. C-myb knockout mice die in utero due to the complete loss of fetal hemopoiesis (10). C-myb is cell cycle regulated in mature hemopoietic cells and is required for their proliferation (9, 47). Furthermore, c-myb is a crucial regulator of hemopoietic cell differentiation (6, 7). B-myb is induced in the S/G2/M phases of the cell cycle and is required for the proliferation of many cell types (11, 13). More recent evidence also suggests a role for B-myb in differentiation. Finally, A-myb expression is restricted to a very few cells and during a restricted stage of their differentiation: it is expressed in immature proliferating spermatocytes, mammary gland ductal epithelial cells, and some neuronal cells (15, 18). It has been demonstrated recently, using A-myb knockout and transgenic animals, that A-myb plays an important role in these restricted cell types (18, 23). The former show defects in spermatocytes and breast duct development (18). Transgenic animals expressing ectopic A-mybin most tissues show a restricted effect on B cells. These animals show hyperplasia of the follicles of peripheral lymphoid organs with an accumulation of CD38+ B cells in the follicles (23). These data demonstrate that A-Myb regulates the proliferation and/or differentiation of GC B cells. 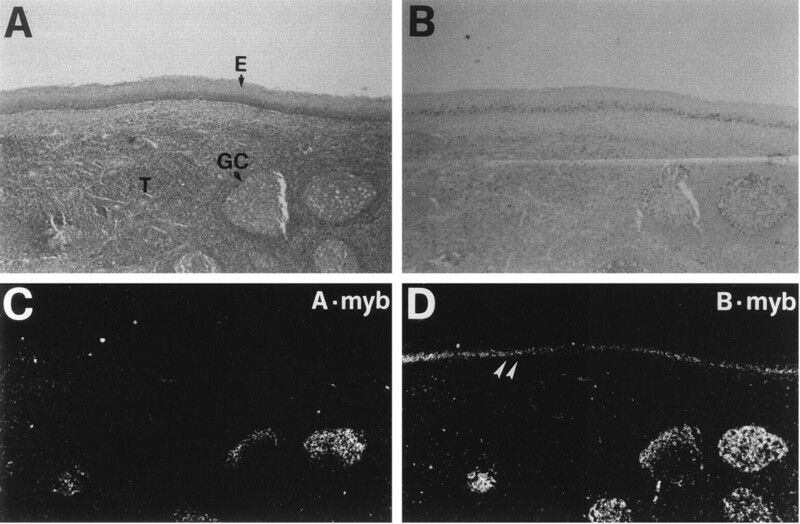 Thus, the present report further defines the role of A-Myb as being specific for centroblasts. A further understanding of A-Myb function in centroblasts will require the definition of its molecular targets in the context of B lymphocytes. Recently, we and others have shown that the c-mycpromoter is up-regulated by A-Myb (48). Furthermore, we have recently shown that A-Myb may be active as a transcriptional factor in B cells only and not in other hemopoietic cells, probably through interaction with a B cell-specific cofactor (48). Thus, the definiton of the target genes, cofactors, and specific signals that induce A-Myb in vivo should prove crucial elements for the understanding of A-Myb function during the GC reaction in response to Ags and in B cell pathologies such as Burkitt’s lymphoma. We thank Felice and Vincenzo de Ceglie for the graphics. ↵1 This work was supported in part by the Italian Association for Cancer Research (AIRC) and the Istituto Superiore di Sanità (Rome, Italy, AIDS project). J.G. is a 1997 Fellow of the Angelo and Angela Valenti Foundation, Milan, Italy. N.S.B.T. is supported by the Kay Kendall Leukaemia Fund. G.L. is supported by the Associazione Italiana Leucemia (AIL), Milan, Italy. 3 Abbreviations used in this paper: GC, germinal center; CD40L, CD40 ligand. Wilkinson, D. G.. 1992. The theory and practice of in situ hybridization. D. Rickwood, and B. D. Hames, eds. In Situ Hybridization: A Practical Appoach 1-13. IRL press, Oxford.